US officials say there is no evidence abnormal levels of viruses or bacteria in the water caused rowers competing in Rio last weekend to fall ill.
Fifteen of the US team were affected at the World Junior Championships, a test event at the same lagoon that will be used for next year's Olympics. 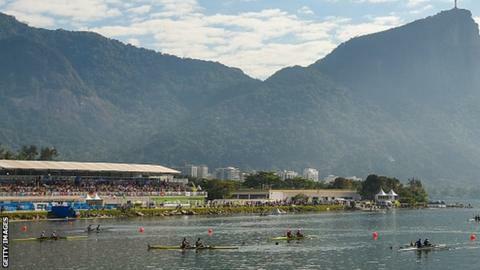 US Rowing chief Glenn Merry said it would be "easy but irresponsible" to blame the water for bouts of diarrhoea. World Rowing has already called for tests on pollution levels in the water. Water quality in Rio, as well as in the seas where the sailing, triathlon and open water swimming events will be held, has been criticised and authorities have admitted their own targets for reducing the amount of sewage in the water would not be met. Event organisers said they treated 14 people for diarrhoea - eight Americans, and three each from Australia and Britain - and that all were medicated and fit enough to compete. Merry added that coaches were also ill, indicating water pollution was not the problem. The only athlete who fell into the lagoon and consumed significant amounts of water was not one of those who was affected, he said. Canadian officials said that none of their 24 athletes and support staff had any signs of illness.